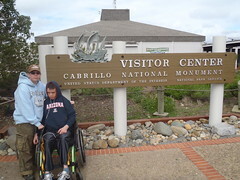 Mik did not want to go to Cabrillo National Monument, but he decided it was better than hanging out at the apartment by himself for a few hours. 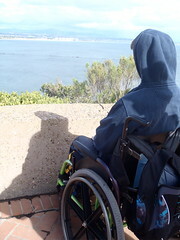 Once there, though, he actually enjoyed it, except for when Dad kept lagging behind taking photos at the lookout area. Although, he saw enough at the visitor's center and did not care to trek up to the lighthouse (he cannot actually go up this anyways due to it being historical and only stairs, but there is still an accessible exhibit and audio/video tour alternative according to their website.). 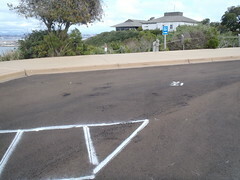 The parking lot was kind of confusing, as they seemed to have just repainted it. There were not blue parking spots or handicap signs. They did have handicap spots, but they were only marked with white paint that had small HC markings and nothing about fines and such, so there were several spots filled with cars with no handicap placards/plates. There was still several spots, though, as there were not many people there anyways. Besides it definitely seems they are just restriping and a temporary thing that might have even been fixed by now. 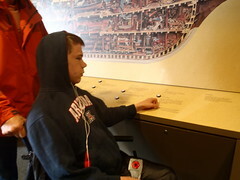 Mik really enjoyed the one little room in the visitor's center that had an exhibit about Juan Rodriguez Cabrillo and his crew's exploration of the California coast in the 1500s. He liked the ship diagram that lit up the location of different parts of the ship. At the gift shop I got my National Park passport stamped and Mik finally decided to get one of his own, especially since we plan to go to the Klondike National Park in Alaska in July. The gift shop was good accessibility wise for the most part, but the automatic doors were closed off and you had to go through the other doors, which were a really tight squeeze if you did not open both. 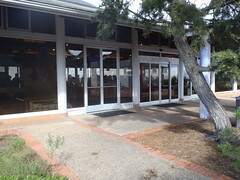 The observation area outside the visitor center has a ramped and step entryway. Mik did not like this part, though, because it was windy and cold. Hence, mainly why he did not want to then go up to the lighthouse.